The Haven is featuring a POP UP STORE ON DEC 15th! 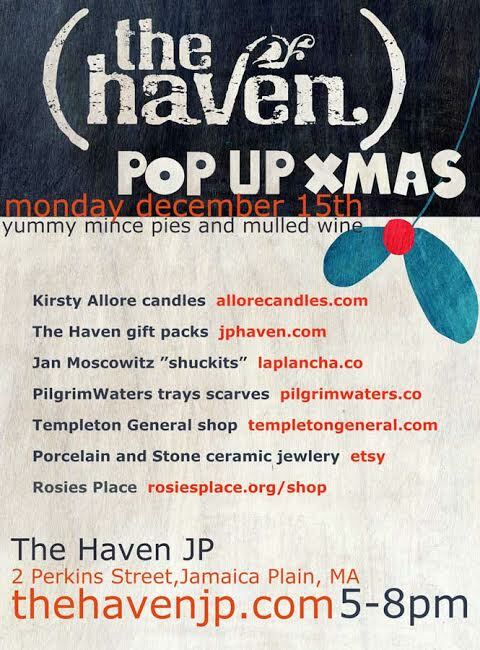 What better way to do your Holiday shopping than to come along to The Haven on Monday 15th 5-8pm? We have made it easy for you to get all your gifts in one place whilst also indulging in some festive Scottish fare! Get in the festive mood with mulled wine and mince pies as we host the most creative, up and coming designers and craft stores in Boston right here in the pub! Here’s a quick hit list of who will be involved – so spread the word!!! Laura Sabolefski : Templeton General gift store, Fort Point. Downeast Cider : Local Cider makers from Maine. The Haven: gift packs- t/shirts,scottish sweets, irn bru,gift certs.